Every summer for the second half of August, my husband Tad's family decamps to a house in Wainscott, New York, that they've owned for 99 years. The big old house, which survived the 1938 hurricane, tolerates our wear and tear and seems to get more handsome by the year. Our kids and their cousins spend their days going to the beach, catching crabs in the pond, playing tennis and soccer and flashlight tag, and then all collapsing into sleep in a pitched-ceiling room on the third floor, known as “The Crow’s Nest.” The parents, meanwhile, spend their days scrambling after the kids, sneaking in a little reading and tennis, and doing a lot of shopping and cooking. Dinners are divided up so that each night just one person is in charge of the dinner for 12, giving everyone else a chance to relax a bit. On my cooking days, I tend to buy up as many tomatoes and ears of corn as possible from the farmstand, and head to The Seafood Shop for the main course. 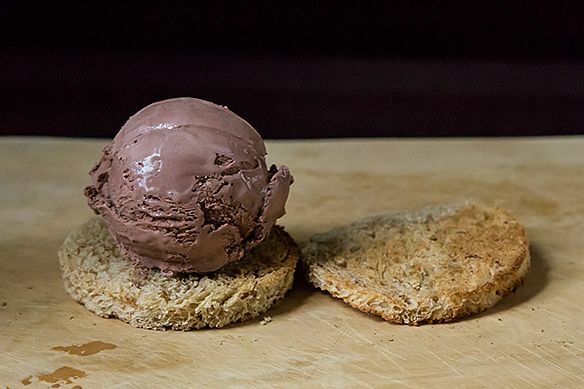 On one of my nights this year, I made the Raspberry Ice Cream Sandwiches for dessert -– which were not only a Wildcard winner on the site, but a wild success among Tad’s family. While we devoured them, my father-in-law’s girlfriend, Mary -- yep, you can still have a girlfriend at age 81 -- told me about a favorite evening snack. 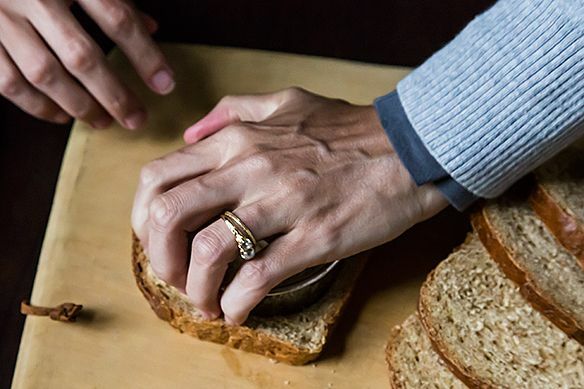 She toasts two slices of whole wheat bread, and, while the bread’s still warm, smushes a scoop of chocolate ice cream between the slices. 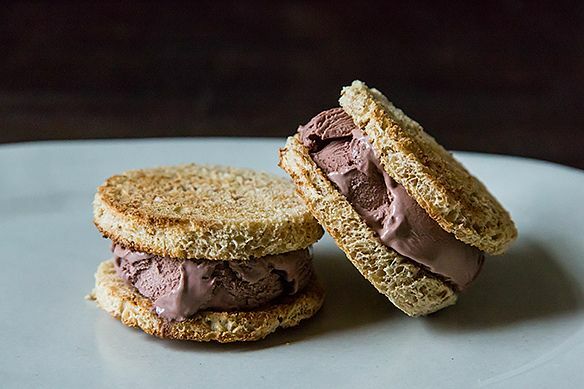 Et voila, an instant ice cream sandwich that's the rag-tag cousin of pain au chocolat. Mary insists the whole wheat bread makes it healthy. I like Mary. I made her ice cream sandwiches for my next dinner. Everyone watched skeptically as I loaded up toasts with chocolate ice cream and passed them around the table. I didn’t pull it off quite right -– I used a multi-grain baguette that was a bit too “multi” and baguette slices just aren’t cushy enough. But back in Brooklyn, I got it right. I used a loaf of soft and nutty sandwich bread and used a cookie cutter to make circles. 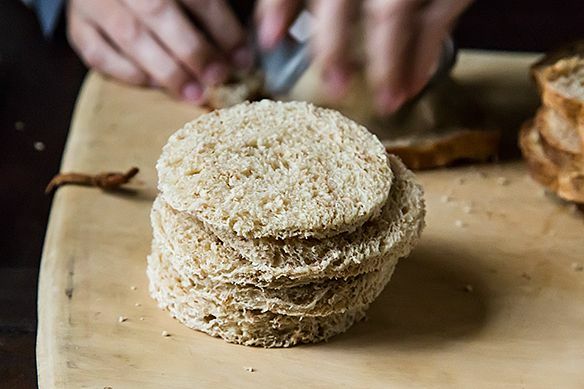 The circles, once toasted, should be crisp but fluffy. You want them to work as a buffer for the ice cream. I made the roundest scoops of ice cream in my power, and topped the sandwich with another warm toast cap. Then I smushed. And smushed. And smushed it down. Until the ice cream spread to the edge of the toast. These two little beauties look like they're posing, don't they? Wouldn't you? There's no need to tweak this simple treat but, if you must, try adding flaky salt, or a warm, toasted marshmallow, or some hazelnut butter, slathered on the toast. But wait -- we're not done yet! 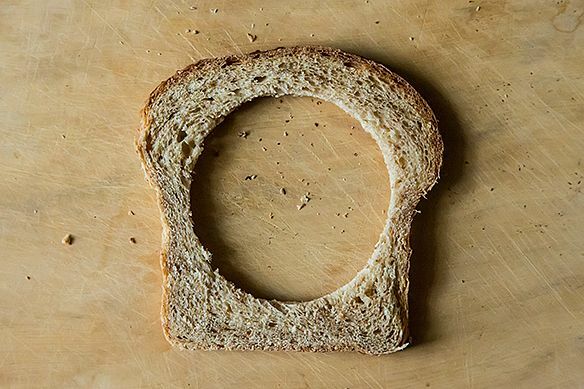 Remember the bread with the cut-out circle? No need to waste it -- this is a twofer, a recipe that would make Tamar Adler proud. Eat your ice cream sandwiches, and in the morning use the bread frames for Toad in a Hole or Merrill's One-Eyed Sandwiches. Wow. Sorry for all recent rude comments. Someone just linked this to Tumblr and it went viral. Prepare for more immaturity. ??????? I keep reading this recipe over and over again, trying to understand IS THIS RECIPE LITERALLY JUST ICE CREAM ON TOAST? WHAT?! It's not meant to be taken very seriously -- it's just an off-beat idea, and we played it up for fun. Try it -- it's good! Why be so unpleasant -- we're a friendly community. If you're looking for more complex cooking ideas, there are plenty on the site. Thanks for visiting. Agree with you - not a recipe, but a how-to/idea.. 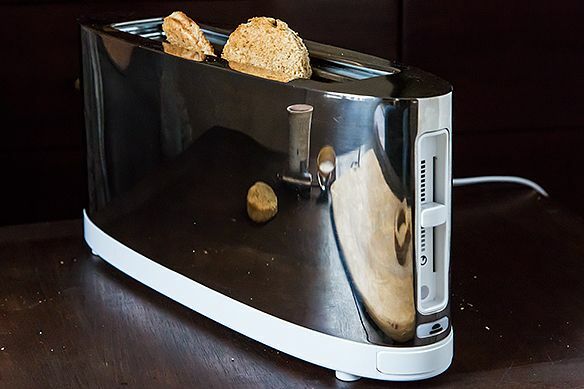 I love your toaster in the tutorial! Please tell me what brand it is. I will be making these as soon as I get a new toaster that works. Yum! Perfect snack/dessert treat. Unfortunately, really unfortunately, I can't eat ice cream, but I will prepare for the rest of the family and have mine with a little frozen yogurt. I don't know why I never thought of this. Thank you Mary and Amanda!!! yum! made these for dessert tonight and cut the bread with a heart-shaped cookie cutter. question: do they qualify as super healthy because the chocolate ice cream we used was organic ;-)? Absolutely. Super-duper healthy if the ice cream is made locally. it is!--blue marble ice cream in brooklyn. YUM! Thanks for the many great comments -- will have to try the brioche version! Love this story. I this recipe falls in the Genius category = ice cream sandwiches + toad in the hole. Right, @miglorious? Right! Between this and those Brown Butter Tomatoes, Amanda's really stepping on my beat! really really love this and the story takes it over the top! Could be my favorite post/story on the site. Nice to hear this -- thank you. This recipe is so simple and sounds so delicious! I will be making it soon. I never in a million years would have thought to do this, but the more I think about it, the more I like it! Thinking a cinnamon toast version could be fun with either chocolate or vanilla. Thanks for sharing the idea! I thought cinammon toast as well! Yummmm. cinnamon toast just took this over the edge for me. the whole thing is brilliant! cannot wait. This reminds me of the gelato served on a split brioche-type roll in Italy. (I think it may originate in Sicily, but I actually ate my first one way north in Camogli.) Standing up at a caffe bar, drinking an espresso and eating ice cream at 8 am - it may not qualify as a healthy breakfast, but I can assure you it did wonders for my mental health. Meechiko, your Fillippino version sounds yummy! Healthy, healthier, slightly-less-healthy.... well, it doesn't make a difference to me, this is a sweet treat everyone can enjoy and which can be done in a jiffy! Is chocolate ice cream healthy? Most would say "no". So how does adding 2 pieces of bread to it transmogrify it into having that status? Some kind of alchemy going on here. But seriously, I think the qualifier here should have been "healthier" and not "healthy". 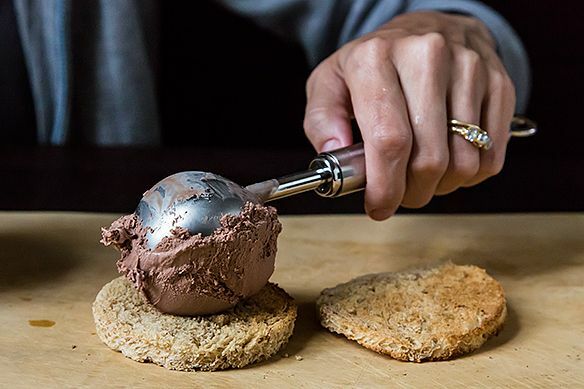 Even if it was, I'd still take offense because a lot of whole wheat bread is loaded with sugar, and when compared to the thin chocolate cookies you often get on either side of an ice cream sandwich it actually has more (not less) sugar AND calories. Healthier? Maybe not. Let's not sacrifice reality for the sake of a catchy title - whaddya say? Torvum, you are absolutely incorrect. I have no idea where you've got your information. 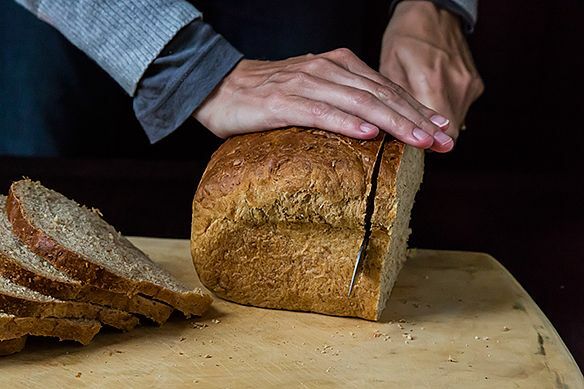 Whole wheat breads are not 'loaded with sugar', the majority of them have around 3-4g of sugar, sometimes even much less (like Nature's Own, which has less than 1g). 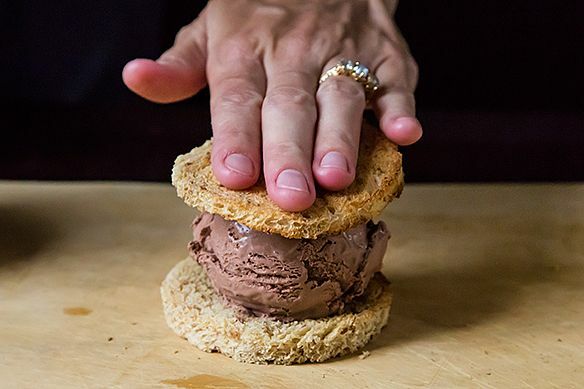 Most ice cream sandwiches use a wafer like outside, which can range in 10-20g alone, just in the sandwich bread itself. Please do research next time instead of jumping the gun. Too bad your condescending attitude can't back-up your intelligence. It is true that there's wide variation in how much sugar, calories, etc. are in whole wheat bread. But, apart from that, you may want to consider the possibility that the name is tongue in cheek. As far as I could tell from the way Amanda told her story, that is what was intended, and I know I certainly meant to have a joking tone when I replied that these sandwiches were healthy for sure. @istva: First of all, you assume that I'm from where you live, which if I'm guessing correctly, is America. There's plenty of whole wheat bread where I'm from that has sugar, or honey, or other sucrose-containing additives, like molasses for instance. There's nothing about "whole wheat" bread that is intrinsically healthy. I could stud my whole wheat bread with M&M's and it would still be called "whole wheat bread". @torvum, we love to welcome new members of Food52, but it's difficult to embrace your comments. 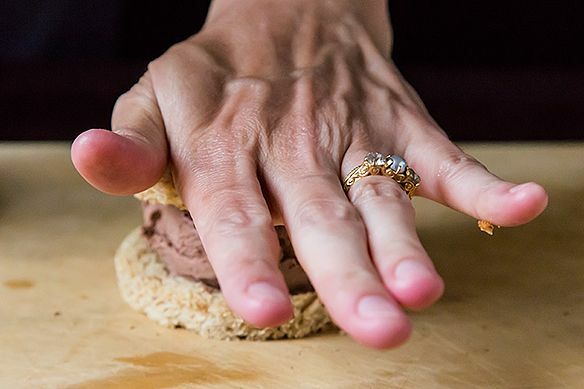 I trust that you (and most readers) know what you're getting into when eating an ice cream sandwich, no matter what kind of bread you're using. It's a dessert, and it contains fat and sugar. Disrespectful comments don't enrich the community and they don't build relationships -- two of the vital things we do here. We welcome your participation on the site, but please keep in mind that we count on our members to be polite and generous, even in disagreement. No doubt about it - this looks delicious. I made a Viana LaPlace recipe from the book Desserts and Sweet Snacks, which is a piece of beautiful bread (like Jim Lahey's No-Knead), untoasted, spread with lemon marmalade and topped with best quality - I hope your own - vanilla ice cream. An open-face ice cream sandwich. Scrumptious. This is so great! Healthy for sure. I definitely have to give this a try. 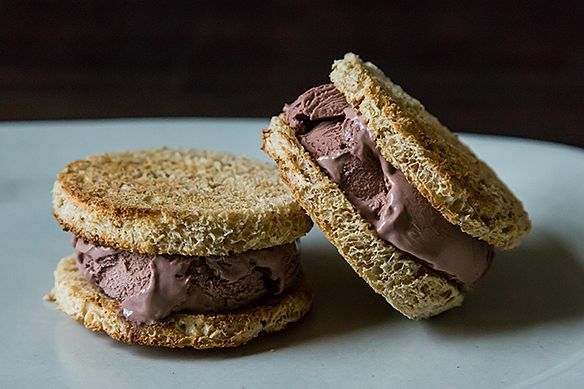 I feel like there are places where it's common to eat ice cream sandwiches made by putting ice cream into a brioche roll as well, though I can't remember where that is, now. I haven't experienced it myself, but I think it's Italy. In Thailand they put it in a hotdog bun! Makes me giggle every time I see it. I love it. My mom tells me that that they used to eat ice cream "sandwiches" in the Philippines by smushing ice cream between two slices of white (untoasted) bread. I used to think she was nuts. I guess she's not as crazy as I thought.